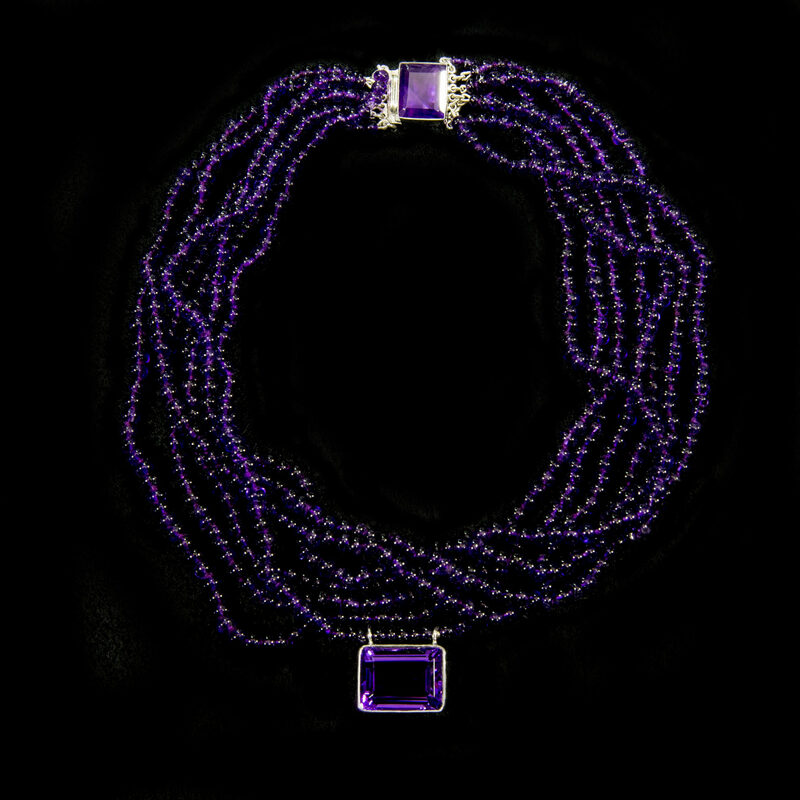 This classic sterling silver necklace features seven strands of small to medium amethyst ‘buttons’, lovely, clean, lively amethyst – emerald cut and bezel set. This can be worn to work, dinner, events or even casually. The clean sparkly pendant and clasp are a perfect foil for the more dense amethyst beads. Another rectangular amethyst set as a clasp in sterling silver sits at the back. It was a crisp, beautiful evening and Lady Jane remembers it will soon be her daughter, Diana’s seventeenth birthday. She imagines how excited her daughter will be when she opens her birthday gift: a lovely faceted amethyst pendant on strands of smooth amethyst beads that offer perfect tonal contrast to the slightly lighter pendant and faceted amethyst clasp. In her mind she calls it the ‘Evening’ necklace. She thinks about her teenage daughter and the pleasure of choosing amethysts as her first piece for both day and evening wear. She has chosen the necklace by her favourite designer Jane Magon. For her, amethysts remind her of the night and the moon (for which Dianna was also known as a goddess). The reference point feels ‘right.’ She knows it will work well with the outfit Diana has chosen to wear at her graduation formal – and that as a classic piece it will work well for her for the rest of her life. The rest of this unique story will be delivered with this incredible and unique piece.